Accedian is the performance assurance solution specialist, with a complete range of components covering service turn-up and monitoring from core-to-edge. With open automation and visualization platforms, Accedian’s programmable hardware and virtualized instrumentation bring actionable, real-time quality of experience (QoS) and quality of experience (QoE) reporting to your network operations. Flexible extensible, and easily integrated into multi-vendor networks, Accedian solution components are right-sized to provide coverage and scale throughout the core, metro, and access. Orchestrated by highly automated, programmable performance platforms, the right mix of components are easily combined into tailored solutions that span performance assurance, optimization and networking functions specific to an operators’ application requirements and network design. From initial service turn-up to per-second performance visibility, and the tools to establish and enforce QoS throughout the network, Accedian can customize a solution that will scale and evolve with the network and services they assure. Accedian performance modules combine small footprint & pluggable hardware with NFV-powered test control, computation and analysis to bring standards-based+ performance assurance to all corners of the network. Right-sized for cost-competitive small cell backhaul and broadband business services applications, modules are fully interoperable with third-party test probes and handhelds, as well as standards-based network elements supporting Ethernet OAM (Y.1731, 802.3ag) and Layer 3 TWAMP (RFC-5357) performance monitoring (PM) protocols. The Smart SFP and GbE units act as test reflectors for both service activation tests (SAT) or PM sessions—or can host them when paired with the SkyLIGHT™ VCX service assurance virtual network function (VNF). When used in combination with the SkyLIGHT Director Manager Module, Accedian modules provide 1-way latency measurements with exceptional precision, along with path-segmented metrics for rapid fault isolation. Adding a performance module to legacy and enterprise-grade network elements, small cells or cable, FTTx or xDSL modems adds Ethernet OAM and PM feature support— bringing ubiquitous QoS visibility to every service edge. Units can be install in-line or out, ensuring they are never a single point of failure when installed in critical network locations. With multiple, programmable feature banks, new capabilities can be loaded into modules remotely to keep pace with evolving standards and new applications. As VNFs evolve, Accedian performance modules will become a key component to virtual CPE (vCPE) strategies, providing hardware-assist for critical edge functions in the smallest possible package. Accedian’s Performance Assurance Software Agent can be installed on network elements lacking integrated PM reflector support. Lightweight and highly customizable, Accedian’s software Agent is installed on third-party small cells, LTE base stations (BSTs), and network appliances, and can be installed on user equipment and virtual. With full TWAMP-Control & Light support, the Agent returns one-way metrics including latency and delay variation. Accedian Networks’ array of Network Performance Elements fuse ultra-fast, programmable packet processing with performance assurance, optimization and MEF-certified networking. 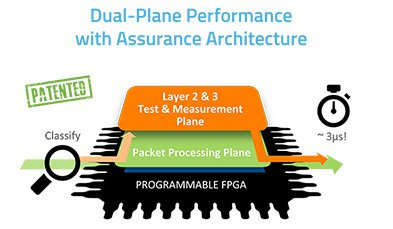 A unique dual-plane FPGA architecture separates traffic conditioning, mapping, filtering and aggregation functions from test & measurement processing. The result is fully parallel traffic processing, test traffic generation & analysis, and per-flow performance monitoring at near-zero latency. Our complete line of open, multi-vendor interoperable and programmable products include GbE and 10 GbE Network Interface Devices (NIDs) that go far beyond standard demarcation functionality. With a unique combination of high resolution monitoring, integrated turn-up testing, low latency networking and traffic optimization, our NIDs are in a class of their own – that’s why we call them Network Performance Elements. These sophisticated, standards-based+ products support capabilities like G.8032v2 protected Ethernet Ring support, Jumbo Frame support, MEF 2.0 Certified hierarchical QoS, Two Way Active Measurement Protocol (TWAMP) monitoring, zero-latency traffic shaping, and automated Y.1564 & RFC-2544 test suites. We have specific models designed to fit demanding mobile backhaul, business services, data center connectivity and financial network applications. Installed in-line or out, Accedian Performance Elements are truly telecom grade, with a 25+ year NEBS Level 3 certified MTBF at extended temperatures. Full Network Interface Device (NID) functionality – including L1-4 loopbacks, traffic tapping & mirroring, and Network-to-Network Interface (NNI & ENNI) demarcation – means assured interoperability with third-party test sets and centralized test probes. Metro Ethernet Forum (MEF) certified, Accedian Performance Elements establish Ethernet Virtual Connections (EVCs) with hierarchical QoS (H-QoS) enforcement at customer, colocation and core sites. Integrated traffic conditioning optimizes service QoS for both provider and client – maximizing bandwidth utilization with 1ppm µ-shaping. In addition to service-edge applications, resilient aggregation and transport are supported by G.8032v2 Ethernet ring functionality.